Last year Peter Brears published this book under the imprint of the Excellent Press, Ludlow. 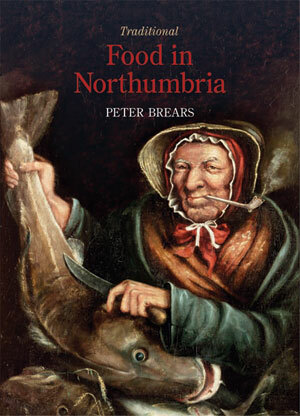 Prospect Books has now taken on this title, both to enhance its distribution and to join it to Peter Brears’s next venture, Traditional Food in Yorkshire. The Northumbrian book contains the same enticing mix of social and culinary history, discussion of culinary artifacts, excellent and well tested recipes, and informative and attractive line illustrations by the author.The books opens with a survey of the inhabitants of the county: the pitmen; the farmers and their labourers; the lead miners; the fishermen and the mariners; not forgetting the poor (note that these books are not concerned with the upper classes – and that itself is a revolution). Brears then moves on to the food itself with separate chapters on meat, fish, vegetables, puddings, cakes, drinks, breads, the store cupboard, and the dairy. He closes with three chapters that look at feasts and celebrations, calendar customers, and rites of passage.You couldn’t improve on such an organisation, and nor will any Northumbrian wish to deny him or herself, this book. It cannot be sufficiently stressed that the traditional food of England has never so far been subjected to such rigorous inspection. We live in the hope that it might transform our estimate of how our forebears lived and ate, and how we ourselves might take some lessons from them.Peter Brears is former Director of the Leeds City Museums and one of England’s foremost authorities on domestic artifacts and historical kitchens and cooking technology. This year he is also publishing Cooking & Dining in Tudor & Early Stuart England with Prospect Books.